Evict-A-Bug based in Brisbane are an owner operated business who have built their reputation through excellent customer service. We offer a full range of pest treatments including termite inspection and treatments, cockroaches, silverfish and rats. 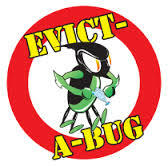 Get in touch with Evict-A-Bug today on 0432 674 568.